We do not bear any other costs if you seek any 3rd party repair or services for any item bought from us. For Apple 61W USB-C Macbook Pro 2016 2017 Power Adapter Charger+Bonus Cable,NEW! The Apple MacBook is a portable laptop computer that comes in a variety of styles and sizes, including the MacBook with a 12 inch screen, the larger MacBook Pro and the lightweight, thin MacBook Air . 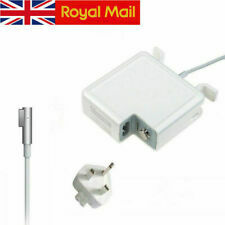 Different power adapters and chargers for Apple MacBook models allow you to ensure you have the correct charger for your specific laptop and that your computer will be fully charged for when you wish to use it. The Apple MacBook has a specific type of jack insert that fits into the computer to allow it to charge from a mains power socket. It's essential that you use only the correct type of cable jack insert or you may damage your Apple computer. Some models have the same jack, whilst others have complete different ones. 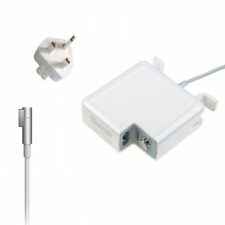 Many of the power adapters and chargers available for the Apple MacBook come with multiple adapter socket attachments. For example, you can purchase a power adapter with an international mains plug adapter already built into the main mechanism. This allows you to, for instance, take the power charger cable with you and use it in Europe, Australia or the USA and Canada, without having to carry a separate international travel adapter for the purpose. 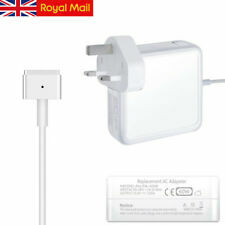 It is also possible to buy an extension cable for your Apple MacBook charger. This allows you to position the laptop computer further away from the mains socket when charging it. This can be an especially useful thing to do if you like to use your MacBook Pro in a position where there are no nearby power sockets. This is a useful feature as it allows you to use your laptop further away from the wall socket, meaning that there is less pulling on the wire, which may help to prevent any damage.